Pardon My Franglais! : Pals came to Paris! But Saturday morning, the fam left and I headed off to Giverny to see some of Monet's flower gardens. Saturday night we drank by the Seine (which we haven't actually done in a while) and then headed over to a rooftop bar, which was a super cool place to see Hotel de Ville (city hall) and the Eiffel Tower, in all her glory. Sunday was 75 and sunny so we met for a pique-nique to take advantage of the beautiful weather. I got pretty sunburnt but it was worth it. My next stop was to run over to meet my friend at her bus stop (she got in an hour early) but ended up waiting for her in the metro - which worked out perfectly (except for the mec throwing up on the platform). 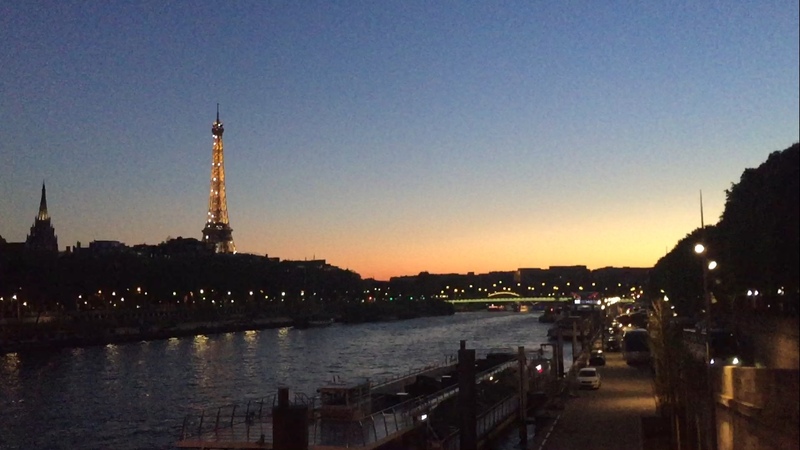 We dropped her stuff off at my homestay and then walked around Paris, down the Champs-Elysees, my fave bridge - Pont Alexandre III and then ended up at the Eiffel Tower for the sunset and some catching up. Dinner was at a classic French bar - a croque monsieur for her, some onion soup for me, and wine for les deux! The next morning we got up and went to Musée de l'Orangerie in the Tuileries before I had class. It was actually perfect timing because I got to see Monet's final paintings after just seeing the lilies in real life. Then I dropped her off at the Louvre while I ran to class. Our other friend was also in Paris for the beginning of the week (amazing timing) and we all got an apéro before we went to Ober Momma for some good Italian food. Dessert was a classic - a crepe by the Notre-Dame aka the perfect way to end the night. Tuesday, I had early class so I went with my roomie-for-the-week to get a croissant and coffee by my school. Luckily when I got to school, my class was cancelled so I showed my friend to the Catacombs and sat at a café and got some work done. We met back up again for lunch (crepes, of course) and then I went to my last class of the day before meeting my friend after she hit up Musée Rodin. Then, another apéro before we headed to Le Marais to grab falafel when ..... our go-to fave (and also Lenny Kravitz's) falafel place was closed for Passover! So sadly, I had to cheat on my one true falafel love. But we went to grab some drinks and a crepe to end our chill Tuesday night. Wednesday we snuck to a quick breakfast at HolyBelly before I dropped my friend off at the airport to head on to her next stop on her spring break trip! That night I got together one last time with my other friend (and her fam) at a cute little cafe for dinner. Thursday was Mojito Night at the Mazet and then some wine and Thai food by the Seine for a perfect night. Friday we pique-niqued again and then had Mexican by the Canal for another fun night. Sadly our little streak had to end on the gray and gloomy Saturday. We were all feeling the weather but went to Angelina's for a pastry and chocolat chaud and then some ramen for dinner. But the night turned foul fast as we tried to drink by the Seine and were accosted by some mecs for a not-so-great end to the night. Thank god for Sunday-recap sessions and Pret à Mangers being open on Easter Sunday. Even when all else fails, Paud is there through it all and I am super grateful. Also, shout out to the fam for taking me on a (virtual) Easter egg hunt and to pals who are there for me no matter which country they are in. Thanks to M for sleeping on the floor and letting me drag you around Paris and to I for always beng down to grab drinks and food and balancing us with your fam!